Burnley's new-look back three was denied a hard-earned point by an injury time Spurs winner at Wembley. Sean Dyche started with three centre backs for the first time in over six years in charge, bringing Kevin Long back into the side, at the expense of Chris Wood, while Aaron Lennon returned for the injured Johann Berg Gudmundsson. The system proved fluid in the first half, 5-4-1 against the ball, and, at times, 3-4-3 with it, with Lennon and Robbie Brady in support of Ashley Barnes. 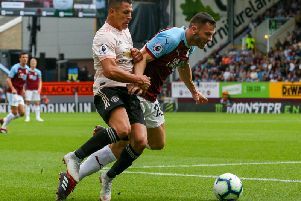 Burnley snapped into challenges and pressed well, earning two early corners, the second of which saw Brady's delivery find Charlie Taylor at the far post, but he was unable to control and the chance was gone. Spurs went over rather than through the back three, with clever movement and runs, and Lucas Moura hooked Erik Lamela's ball over the top just wide, after getting in behind Phil Bardsley. Harry Kane wanted a penalty after being barged over by James Tarkowski, with Graham Scott unmoved. Burnley continued to frustrate Spurs, though Joe Hart was off his line quickly to make a stop from Lamela, who was played in by Moussa Sissioko. Had Spurs scored, Sean Dyche would have been furious - Scott giving a free kick against Brady for attempting an overhead kick, which Spurs broke from. Burnley, of course, were denied a spot kick as Bardsley was caught by a high foot against Brighton. Right before the break, Burnley pressed and forced a poor pass from Hugo Lloris, and Bardsley stood up a cross, which Barnes flicked high and wide - holding his head in his hands, after realising he had more time and space than he thought. Barnes had the first opening of the second half as well, as Lennon lifted over a cross, and the striker's volley was blocked by Kane and Toby Alderweireld. As Burnley continued to frustrate Spurs, Brady was booked for not taking a free kick as quickly as the home fans wanted, before Bardsley suffered the same fate with a throw in. The Spurs fans continued to howl every time the Clarets took the sting out of the game, and Hart again had to make a stop from Lamela after Danny Rose's cross dropped invitingly, with Kane somehow not booked for a late lunge at Tarkowski for the loose ball. Alli poked the ball wide after Son's crossshot trickled through, with Bardsley just doing enough, but in the first minute of four added on, Kane held the ball up and teed up Christian Eriksen, who swept his finish past Hart.